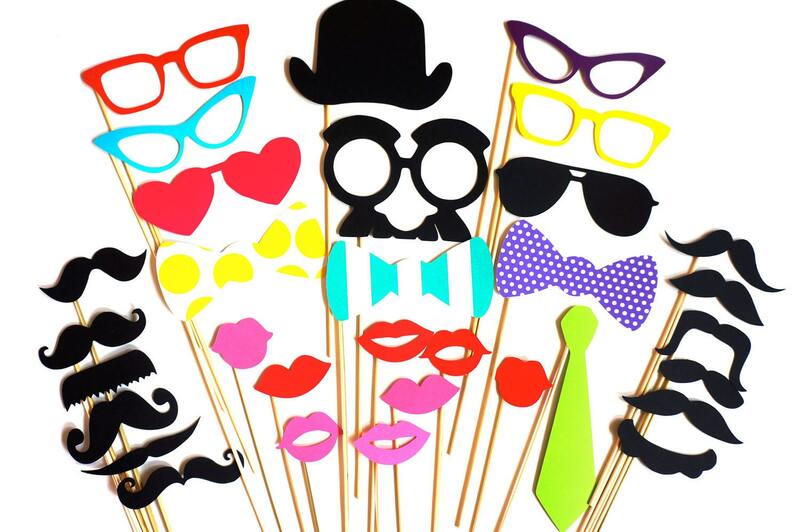 32 piece Photo Booth Prop Set - On Sale for a LIMITED TIME ONLY! ♥ Need them FAST? No problem! Just let us know the date of your event in the "note to seller" section during checkout! ♥ We have been featured in US WEEKLY MAGAZINE, IN TOUCH MAGAZINE, PERFECT WEDDINGS MAGAZINE, and THE KNOT, as well as a variety of blogs and websites including SWANKY CHIC FETE, BRIDEFINDS, and PRETTYLITTLEWEDDINGS.COM! ♥ Ships via USPS Priority Mail (2-3 day delivery) with tracking number confirmation (for USA shipping only- please see our policies for international shipping)! ♥ Please include the date of your event in the "note to seller" section during checkout! This listing is for a set of 32 ultra-cool props on a stick! We have a variety of styles and colors to choose from and they start at just $5! We have both printed signs that we ship to you as well as digital downloads you can design yourself and print at home for a fraction of the cost!